Sometimes the genesis of a startup happens just like this: Guy buys iPhone. Guy breaks iPhone. Guy then pays Apple way too much to fix said phone, grumbling ensues. Guy breaks phone again. Roommate breaks phone. Then, a lightbulb goes off. This is what happened to A.J. Forsythe when he was a student at California Polytechnic State University. He and his friends broke their iPhones more than a few times, so he decided to teach himself how to fix it. Then, like any good entrepreneur, he turned that solution into a business. Forsythe started charging people at school $75 per fix, set up a few social media accounts to hawk his services, remodeled his room into a repair shop, and iCracked was born. Forsythe sourced distributors of inexpensive screens, eventually finding those he could trust, and then began pitching the business to college campuses. By March 2011, about a year after initially hatching the idea, the business had grown beyond them — to 20 locations across the country — and was profitable. Forsythe began to hire tech-savvy “iTechnicians” to help he and his partners absorb the demand. The majority of iPhone breaks are superficial, and replacement screens can be purchased for cheap, yet iPhone users are traditionally locked into the process of searching for a proximate Apple retail store, making an appointment, only to discover when they get there that Apple will be charging them upwards of $200 for a replacement phone. And oftentimes this means losing some or all of the data on your old phone. Thus, for iPhone owners with with superficial damages, one could still charge customers $100 for repair, which they would happily pay at the competitive price, while the expense of parts and service is comparatively small. The opportunity and the margins are there, but the iCracked team is being smart about their approach to the business, as they want to become an all-in-one solution for people with broken devices, regardless of their location. 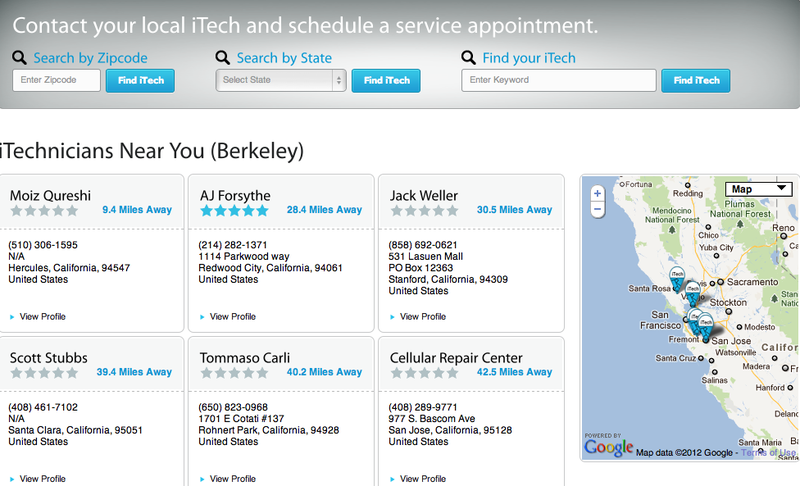 Today, the startup offers three repair options: Users can find a certified local iTechnician near them and schedule an appointment. (iCracked now has 125 technicians working for them, many of them freelance. If they operate within a 30 minute-drive of your location, they’ll come to you.) The second option is to repair by mail, which takes 3 to 5 days to turnaround, though the team can send you an “interim Go-Phone” if you can’t be without your phone for 5 days. 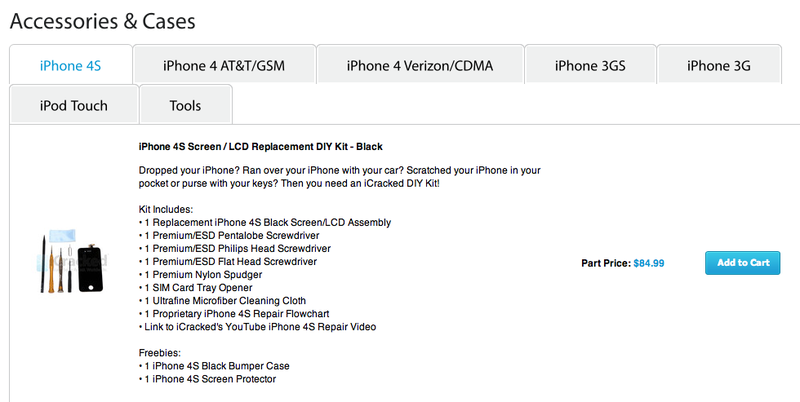 The last option is DIY, in which iCracked sends people a complete repair kit with detailed instructions to allow you to fix your own phone. They hit all three bases there pretty well. Without a 20K+ person team like Geek Squad, it’s tough to be everything to everyone. But for a team of 15, with 150 technicians, iCracked seems to be on the right track. They wouldn’t tell me what their revenues look like right now, but they did say that they continue to be profitable and are re-investing nearly $9 out of every $10, which, again, makes sense given their stage of development. In terms of what they fix, obviously the team has considered Android phones, due to the platform’s explosive adoption, but the carrier fragmentation has them staying away from the OS at this point. Instead, they stick to Apple, repairing all three generations of the iPod Touch, iPhones, and though their website currently doesn’t show that they repair iPads, they do, and that functionality should be on the site within the next week. They take these repair options, and rather than go for a brick and mortar approach, which means overhead and a lot of sunk costs, iCracked keeps it remote (although they do have one store in Long Beach). They let people buy the things they need for repairs on the site, and keep their iTechnicians stocked with what parts they need. 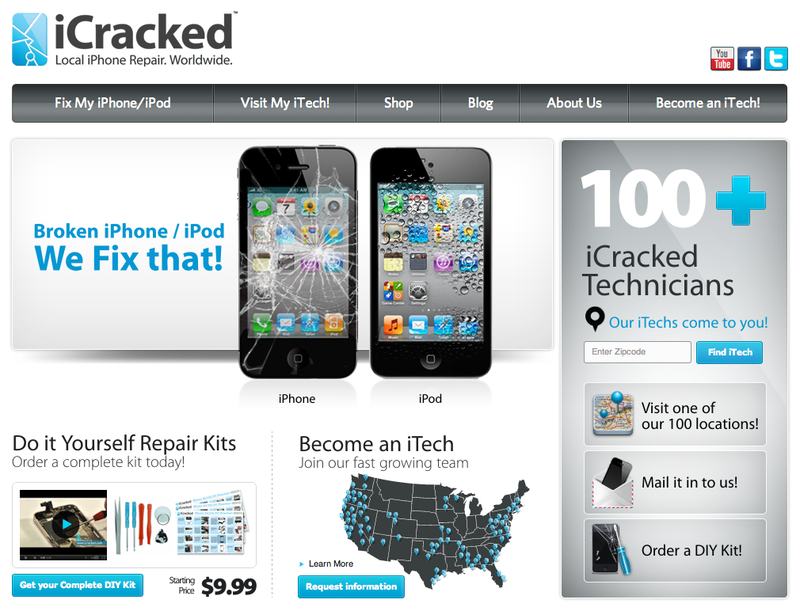 iCracked will replace all cracked screens, repair most water damaged iPhones, and will give free diagnosis and repair estimates, most of which they claim to be able to fix. The other smart thing the guys are doing in terms of complementary services/revenue is that they offer buyback on all old iPhones and will recycle iPhones, iPods, and iPads when customers ask for it. Naturally, the next step for the company is to expand into refurbishing and reselling iPhones, but the biggest key, Forsythe says, is that, if a potential customer can’t find an iCracked technician within a close distance and needs to do repair-by-mail, all shipping, handling, insurance and service costs are included in the flat rate service fee. Plus, they offer a one year warranty on all iCracked services. The next big obstacle standing in their way is scale, but as an already-profitable young company, that’s been through the Y Combinator ringer, iCracked could be attractive to investors. And if they’re able to raise some capital, growing under the freelance model could be a breeze. Of course, vetting and quality assurance of those iTechnicians is a challenge in and of itself. It will be interesting to see how this plays out, but I have a feeling if they bring on the right investors and advisors, iCracked is going to be around for awhile, and it will be perhaps even more interesting to see how Apple reacts. For more, check out iCracked at home here.